This last week was a doozy. Much of what I’ll be posting below relates to the mass murder in Isla Vista. CN: Depressing, familiar misogyny. I work in public health emergency preparedness, so this book about the 1918-1919 influenza pandemic has been on my to-read list for a while. People rave about it; even though it’s about 450 pages of small print, I was ready to dive into it because I already have an interest in this sort of thing, I have some background in working on preparing for a pandemic, and I’ve found that histories of diseases and other medical issues (“The Immortal Life of Henrietta Lacks,” “The Ghost Map,” about cholera in London) can be really fascinating reads. Unfortunately I can’t sing the praises of this book in the same way my colleagues (and apparently every major newspaper) have. The book is clearly impeccably researched. The author spent seven years on it, and admits in the acknowledgments that he set out to write a very different book initially. He also lets the reader know that there actually isn’t a lot written in terms of first-hand accounts of experiencing the pandemic. There is a lot of information on the work done by scientists, and the work done by the military and government at the higher levels, but he isn’t able to really get into the areas that I am most interested in: how cities dealt with the pandemic. Basically, I feel like the author wrote three books and attempted to weave them all together. Others say he was very successful in doing this; I think he was not. 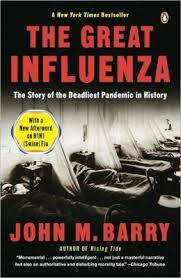 First, there’s the story of the scientists trying to figure out what was causing the influenza (a virus? A bacteria?). This story includes providing 80 pages of history of medicine. That is … fine, and I suppose sort of sets the stage? But not really. It felt like it could have been pared down to 15 or 20 pages and still more than gotten the point across that by the time this pandemic hit in 1918, medicine was still really in the dark ages. The second story is about the war and the military’s treatment of the pandemic. If the information in here is accurate, well, DAMN. Wilson was not a great president when it comes to caring for civilians. He apparently didn’t really even acknowledge the pandemic and the devastation it was causing throughout the country, and pushed for some decisions that clearly cost lives unnecessarily – namely continuing to allow such close quarters at military bases. This part of the book was getting more at what I thought I would be reading about, but even this was oddly fleshed out. It didn’t fit very well, and kept popping up. And this gets me to the issues of organization. In “The Immortal Life of Henrietta Lacks,” the author jumps back and forth along a timeline. At the start of each chapter, that timeline is there, and she provides a consistent visual to let the reader know where we are going to be in this chapter – allows us to prepare ourselves to process what we’re going to read. I appreciate that some people prefer to be along for the ride – and I’ve enjoyed that when reading novels. But I found it utterly distracting in this book. Half the time I wasn’t sure where or when the chapter was taking place. The fall wave of the 1918 pandemic was not that long – it passed through cities in a matter of weeks – but other than the occasional date thrown out in the middle of a chapter, I didn’t really know how each component fit in with the whole. Finally, there was the third, and very small, book, and sadly that was the book I thought I was reading. It was almost entirely contained in chapters 17, 18 and 19. Those chapters talk about what the city of Philadelphia did – or more accurately did not do – to inform and protect the public. That is the story I am most interested in, and those chapters were well-written. There just wasn’t enough of it. I can’t say that I would recommend this book. Again, it appears to be very well-researched, and probably interesting to those who really want a history of the medical side. But not so great if you’re interested in learning about how individuals and cities prepared for and responded to the pandemic. I’ve been in the middle of a few books for the past month – the fifth book in A Song of Ice and Fire (it is over 1,000 pages and I’m only 100 pages in), The Great Influenza (only halfway through), and a new YA steampunk book. But I just couldn’t get into any of them. So I decided to find a quick, fun read to kick-start my summer reading and this one did the trick. 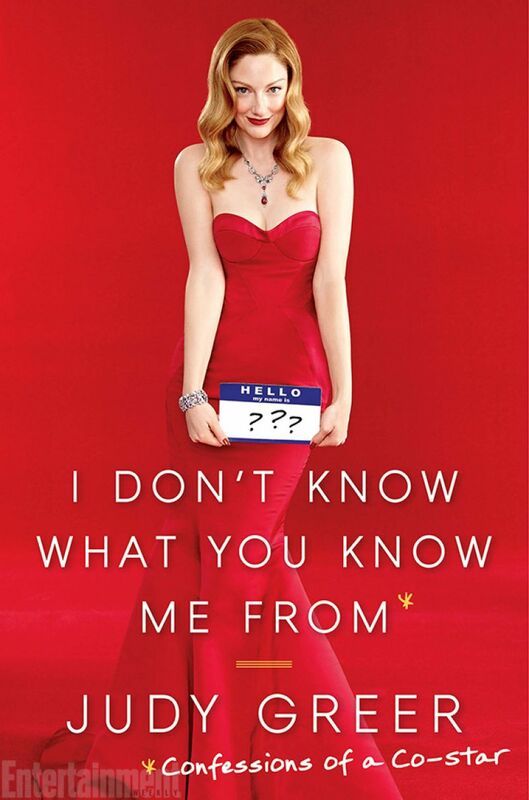 Now, I actually do know what I know Judy Greer from. She’s the voice of one of the best characters on Archer (Cheryl / Cherlene), she was the frenemy in 13 Going on 30, and of course Mr. Bluth’s assistance in Arrested Development. Oooh! And she was in 27 Dresses. Actually she’s been in over 40 movies, so you’ve probably seen her in something. But I can definitely see how she might be the most obvious actress version of the “Hey, It’s THAT Guy!” feature. The book itself is fine. It’s a very quick read, it’s mostly entertaining, and it offers a little insight into this actress, although not much insight into being an actress in general. I think the title gives the impression that the book will be more of an entertainment behind-the-scenes, when in reality it is more of a thin memoir of a woman who happens to be an actress. The stories are mostly interesting, but I do think that the book feels a little … well a little like something a brand new writer would write. Most of the chapters read like they started with an anecdote she wanted to tell, but wasn’t quite able to fill in enough details to really build it out. But it was fun, I enjoyed it, and I don’t feel like it was a wasted couple of hours. Just got back from Philadelphia, where the weather was great until we were leaving. Taking off in a thunderstorm is not my idea of fun. But I’m happy to be home. Summer visited again this week. It was pretty lovely. This weekend I get to see a friend from grad school. It’s going to rain, but we will persevere. But first, what’s been going on this week? It’s May Day, which means protest marches in Seattle. The Mayor announced a plan for a $15 minimum wage, but it doesn’t go far enough, so that’s … bittersweet? Disappointing? Unclear.